So You Think Improv is Easy? When I was in college, I found myself in an Improv class. I’m sure I wanted to take some sort of communications credit and the class was full, so in order to fill the elective, I took the only other alternative: Improvisation. I prayed that the class would be an intellectual discourse on the history of theatre, comedy, acting etc. Nope. Our next task in the class, was to gather in a large circle. One at a time we each had to pretend to open an umbrella, hold it over our heads, and close it again. Simple, right? The first few people did the obvious. Then one person added a shake before they closed their “umbrella” and it suddenly seemed more real. The next person added a twirl over her head, and before you know it, we were all really seeing each others’ umbrellas. Adding little tiny details mattered when it came to believability. Cast characters from within the class. 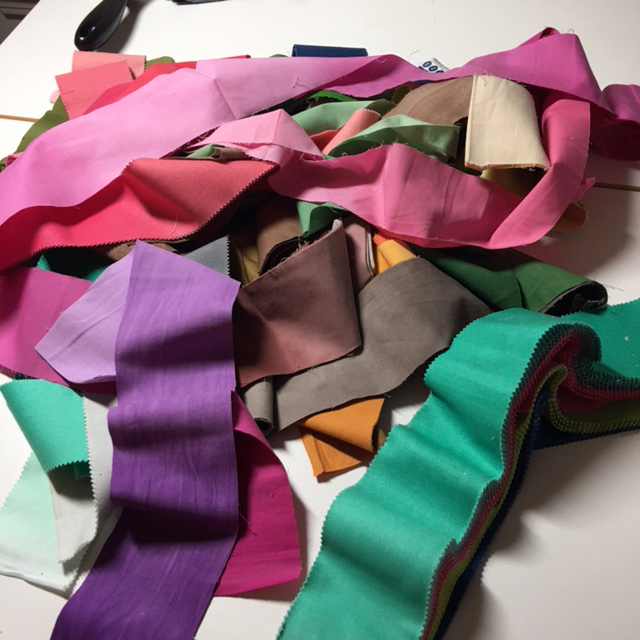 All of this brings me to improvisational quilting…or improvisational piecing, which comes first. 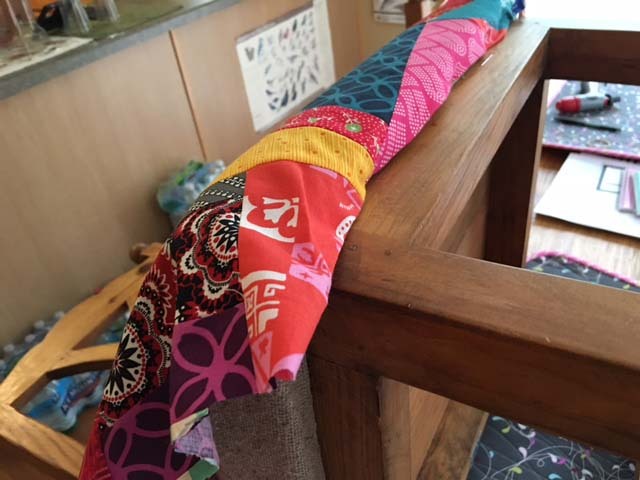 I wanted to do something freeing, use up some fabric and make something that has not been done by anyone else…at least not in the exact same way. 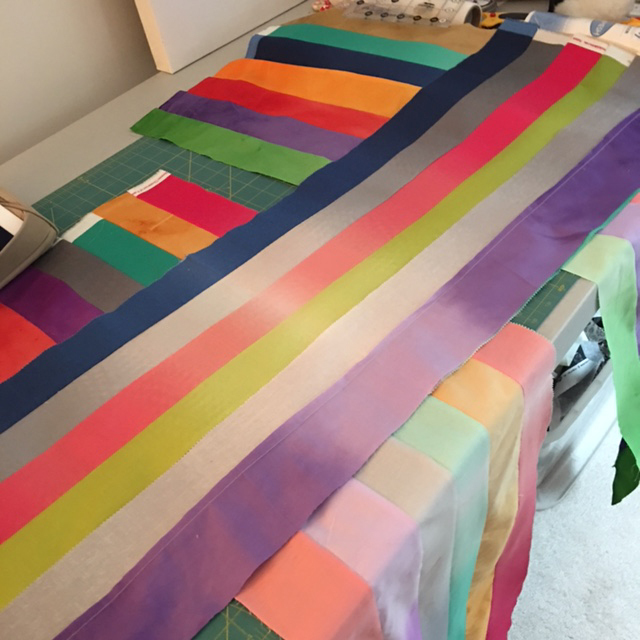 I had to use the colorful jelly rolls of ombre fabric. I am not allowed to square everything up into even-sized blocks. It has to be more free-flowing than that. That’s it. Those are my two rules. As you can see, the fabrics themselves have movement. The colors are cheerful and I had plenty to work with…at least to start. I can safely say that I have no idea where I’m going with this. 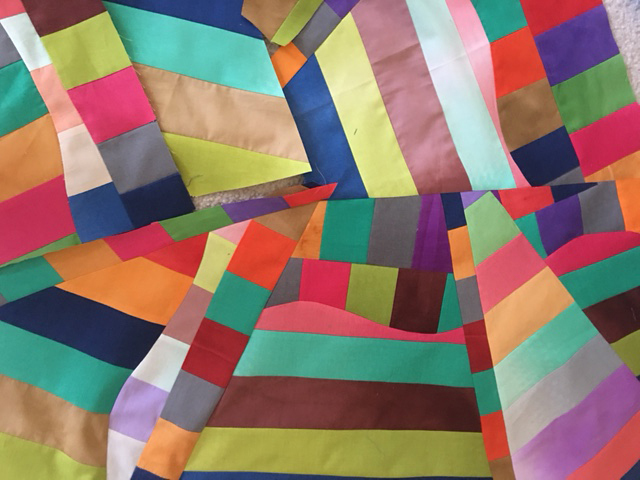 The challenging part comes in the curves and Y-seams. 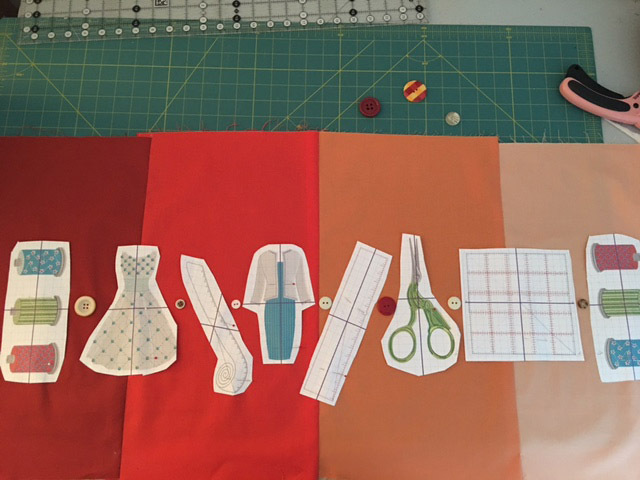 If you’re not used to sewing curves, it can be daunting as there are just so many variables to keep nice and neat. It takes a little bit of thoughtfulness. Just like improv acting. Go with it. Try it. Don’t say no to the crazy seam. If it hasn’t been done before, I’m in. Even if it has been done before, but it can be done slightly differently, I’m in. What I’m not really interested in doing is creating exactly what someone else has already created. Let’s be honest, here. Nothing under the sun is really new any more. We all receive our inspiration from someone, or something, or some technique. Original ideas come from many places, but they almost always require inspiration from somewhere, and we all learn from one another. That’s OK. As long as it’s new to you. I don’t judge people who take a pattern and re-create it exactly as the book dictates. That’s how we learn. We aren’t all designers. I’m not…at least I don’t get paid to be one. But my favorite projects come to me like a whirlwind, and I have all to do to scribble them down before they disappear. The end product is not always exactly what I had planned, but I know when I have a starting point. My challenge: To create a project based on some digitized rulers created in Artwork Canvas within Bernina Embroidery Software 8. I started with the 3 black ruler shapes, wondering how to place them in an interesting project. 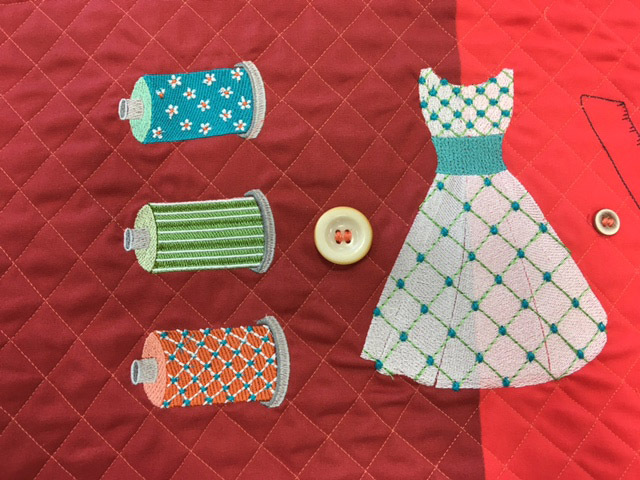 I knew I wanted to use a sewing theme, and I also wanted to incorporate Amanda Murphy’s Sewing Room embroidery designs. I thought they were cute and fresh. (See the link below). Sitting at the computer one day, I had an idea. I don’t ever design on a computer. It’s just not fast enough to capture the idea before I talk myself out of it. 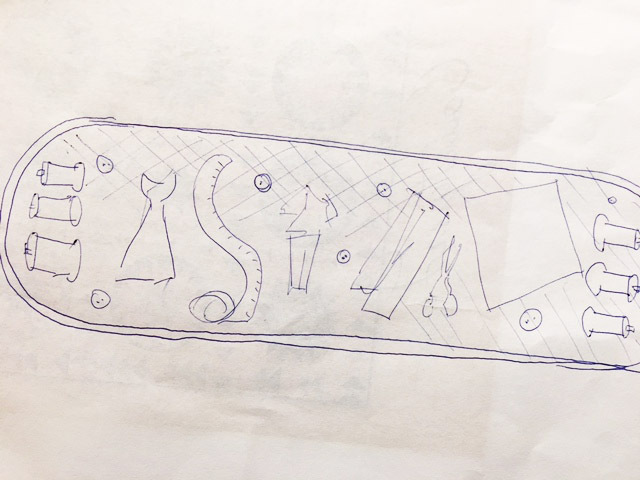 So I grabbed the back of the closest sheet of paper and scribbled out this initial design. I thought I’d make a table runner, with all the embroidery designs lined up in a row. I thought about adding buttons scattered around the design, since the theme has thread spools, scissors , rulers, etc. 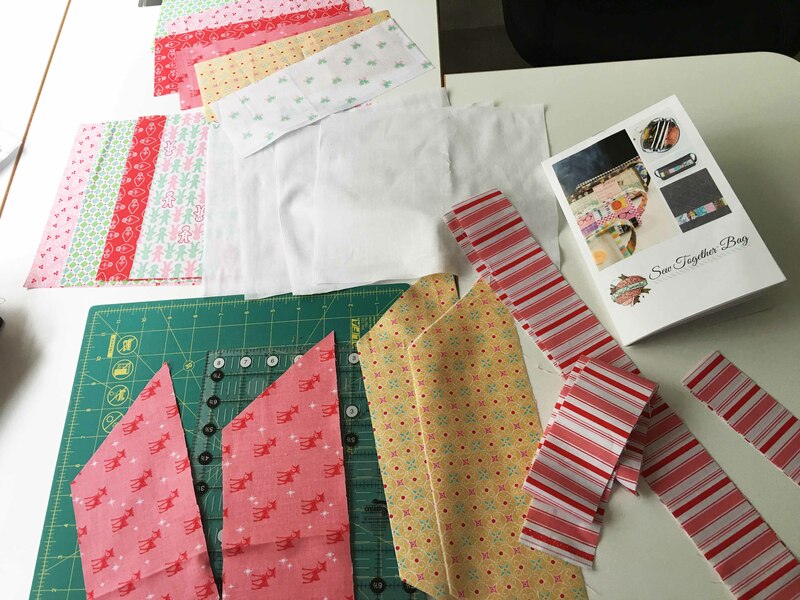 I didn’t have any fabric at home that was close to my reach that was in the right shape to hold all the designs. So I stitched a number of half fatquarters together (fat-eighths). I think they were leftover from this project. And I printed out some templates to see if I was getting close to my original thought. It was going to work. 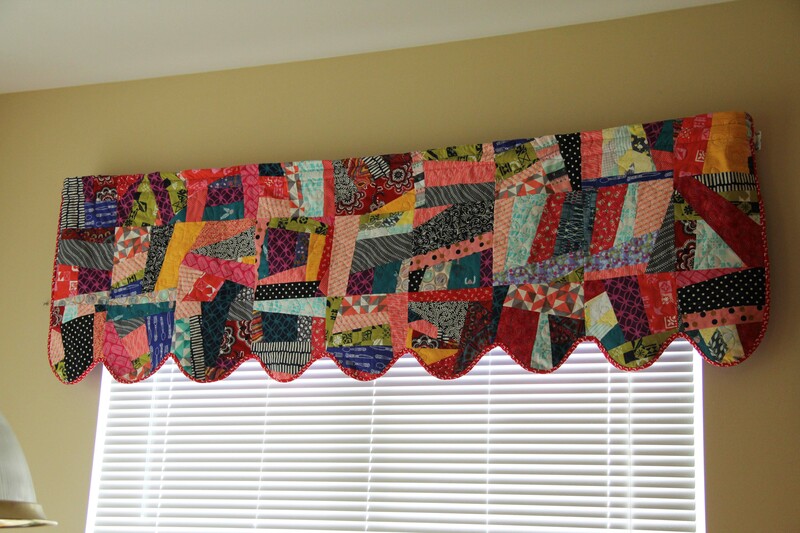 I had actually been thinking of it as a table runner, but when she said valance, I suddenly saw that too! 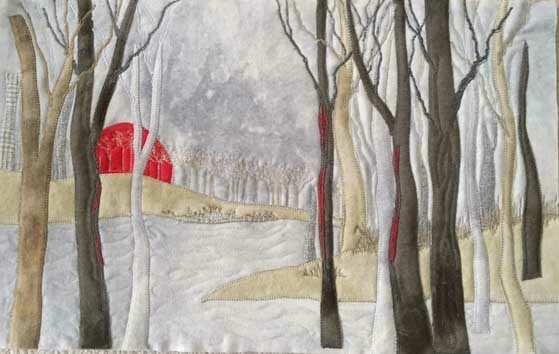 I continued with the quilting which for some reason was a part of the original scribble and I couldn’t depart from it. Here are a few of the detail shots. 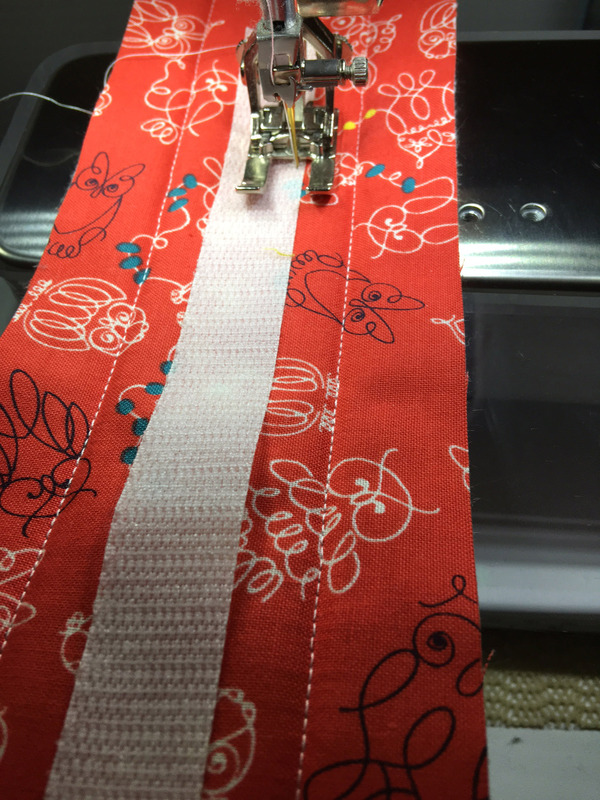 I’m sure you can see why I wanted to use Amanda Murphy’s embroideries…but it actually works pretty well with the digitized rulers. Here’s what it looks like complete. 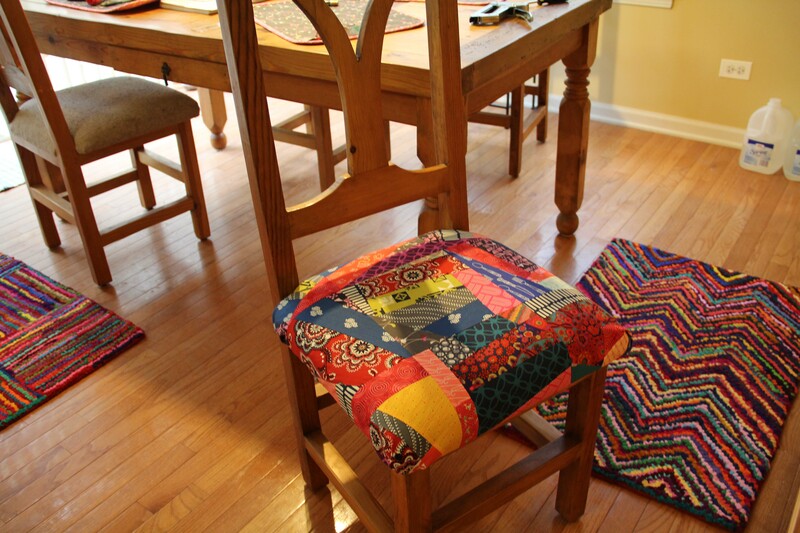 It’s quilted all over using a walking foot, and the back is turned down to form a rod pocket. It will be at the shop for a while, but I can’t wait to hang it on the window in my sewing room. I moved the random-sized buttons to the middle to give it a look of continuity. I love the Barbie-style dresses. 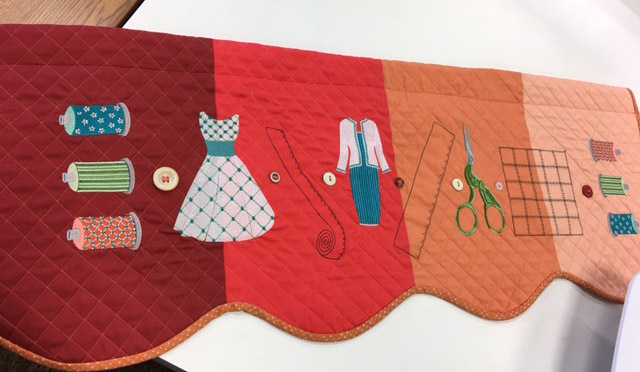 You can make the rulers if you attend Bernina’s November Software Inspiration class at your local dealer. 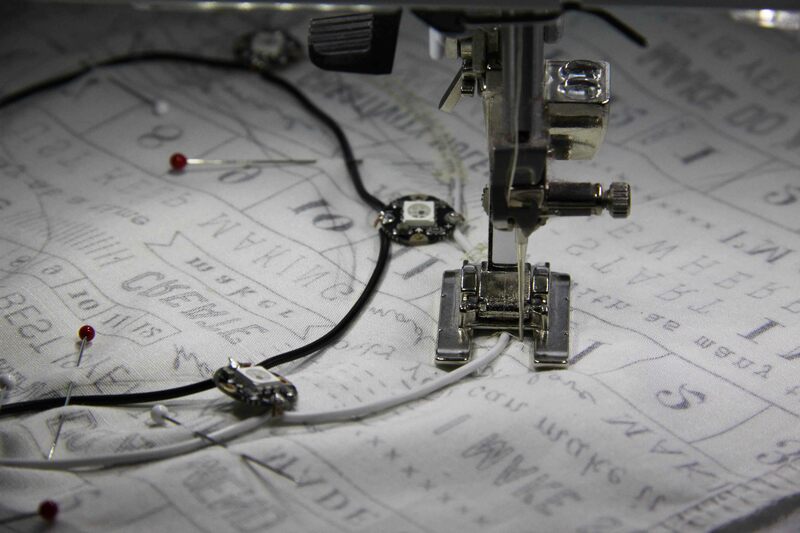 And if you don’t have software, I’m sure you can find a measuring tape embroidery or replace it with another design. 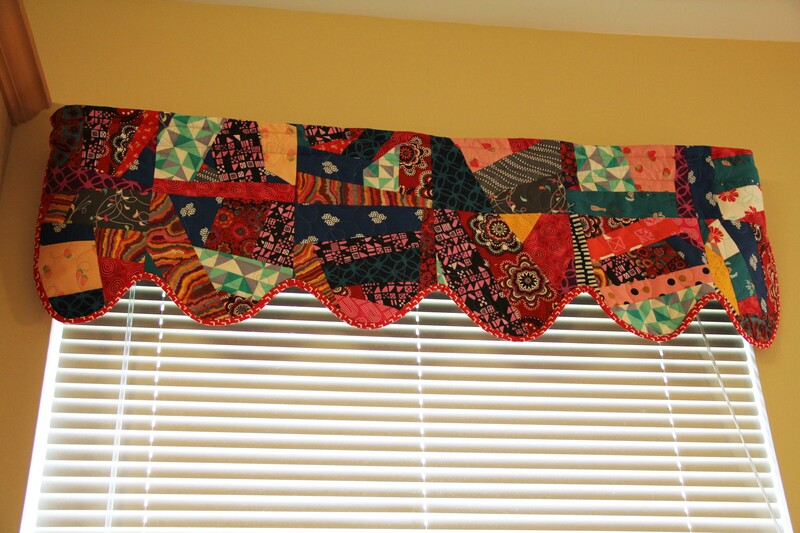 The point is not to make the same valance I made, (although you certainly are welcome to do that) but to make it your own! 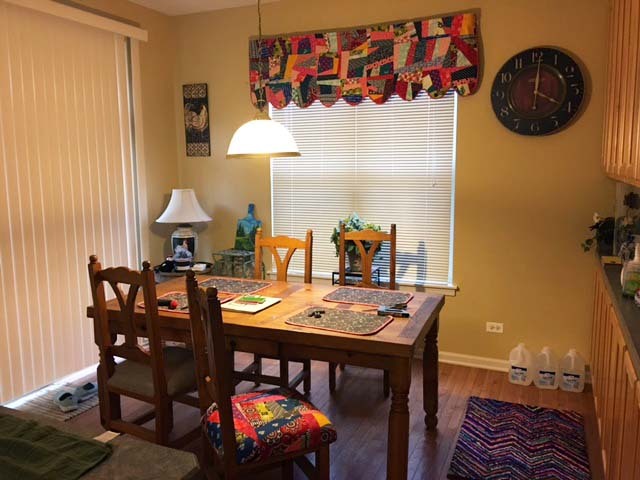 Have fun with the idea, and create something new and original for your own home. 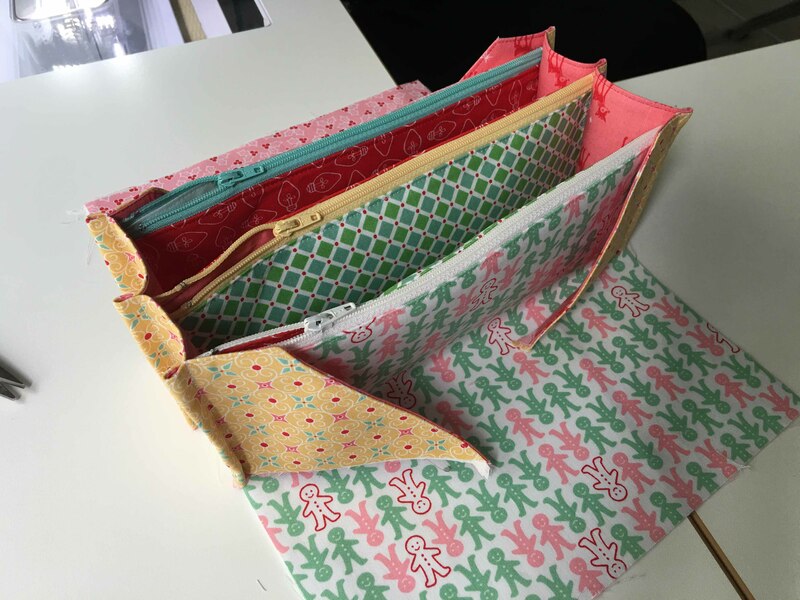 So I finally got around to making one of these Sew Together bags. Have you seen them? Here’s your convenient link to purchase the pattern. Or ask your local quilt store to get it in for you. It’s from a designer named Sew Demented. That should give you a hint. One blogger noted that everyone wants to receive one as a gift….because no one wants to actually make one. Here’s the thing. It’s not a difficult bag to make. It’s extremely functional. 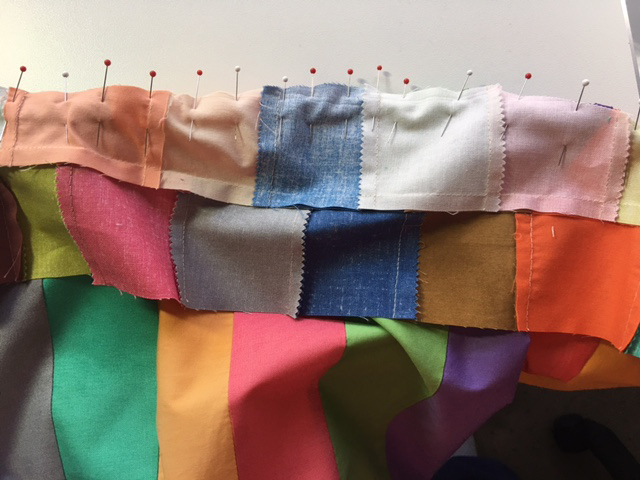 It just takes a little time and patience and the more varieties of fabric the better. And all the cool kids are making it. Take a peek at Pinterest. 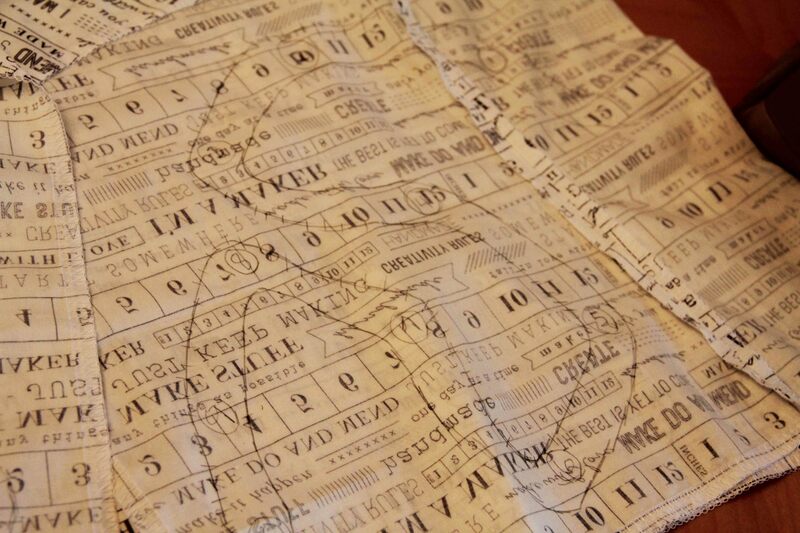 I had never heard of this pattern until I made the sample for our Bernina Software Inspirations class. Turns out the “software” part was the easiest thing to do. 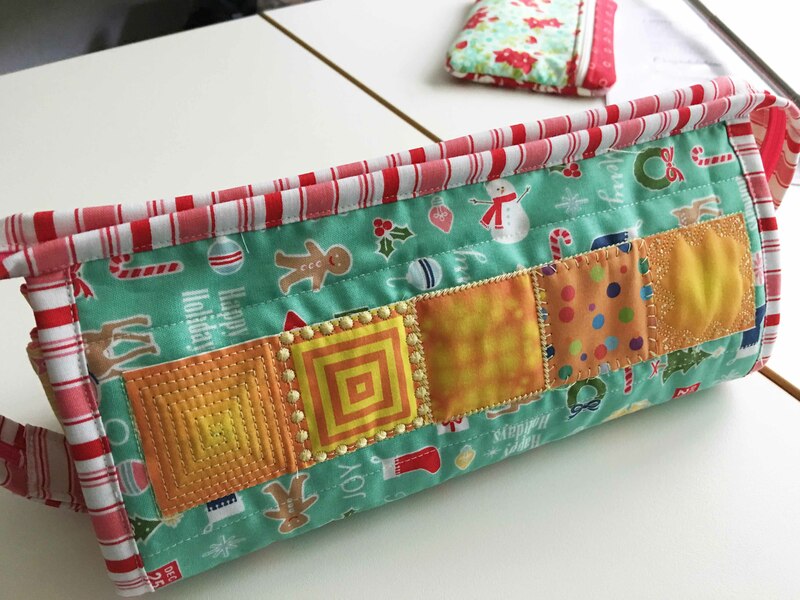 (And the embroidery software is optional…you can quilt or just leave the front of your bag plain). 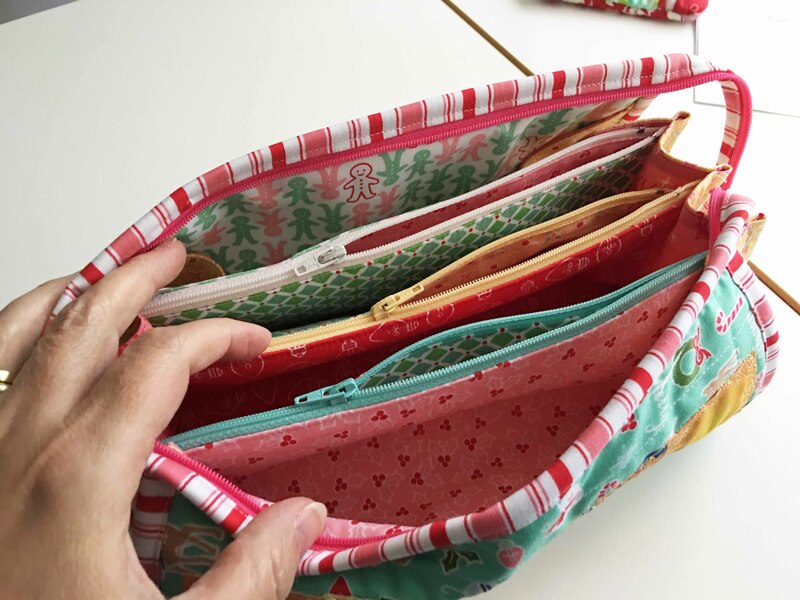 The idea behind this bag, is that you can carry all your sewing supplies in it and keep things organized. You will see in the pictures that the bag has 3 zipper pouches with pockets in between. If you have a fear of zippers, you will overcome it completely with this bag. In my humble opinion, the hardest part of any bag project is getting everything cut ahead of time. And with this bag, you’ll want to use as many different types of fabric as possible. The fun part is how scrappy and colorful and interesting each one can be. 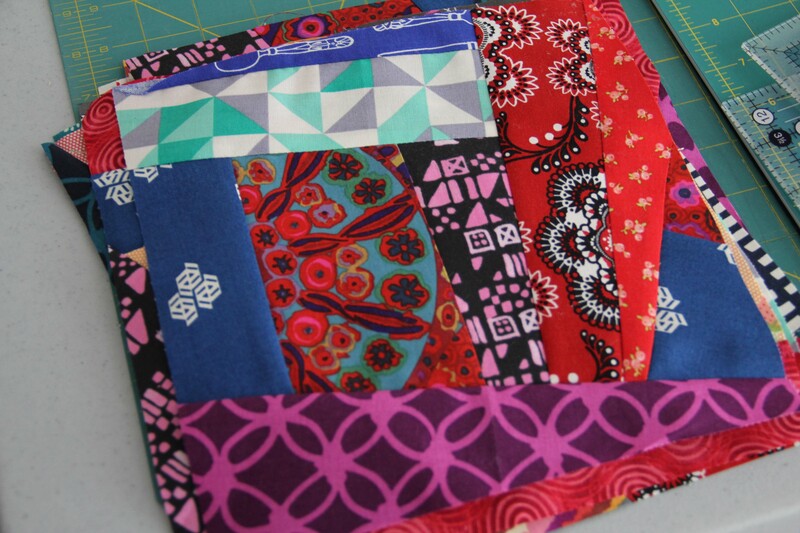 Grab a fabric line you love and get a bunch of fatquarters from that line. The brighter the better, and a fun binding doesn’t hurt either. At this point, I highly recommend using this tutorial to assist in your assembly. Read the directions in the pattern, then read this tutorial. They are very helpful. 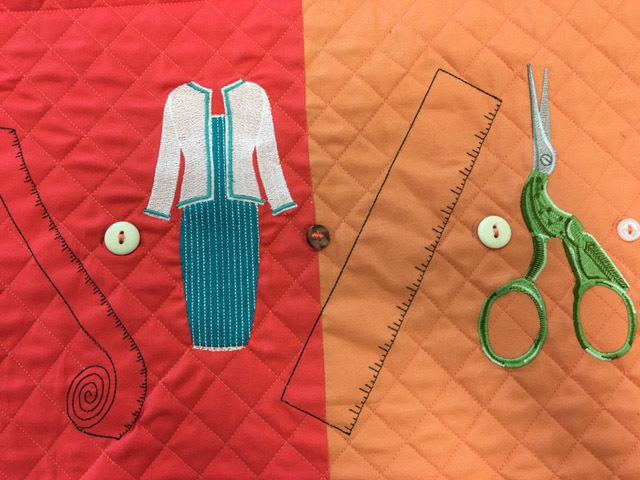 The pattern calls for you to lay your fabrics in order and you install the zippers assembly-line style. 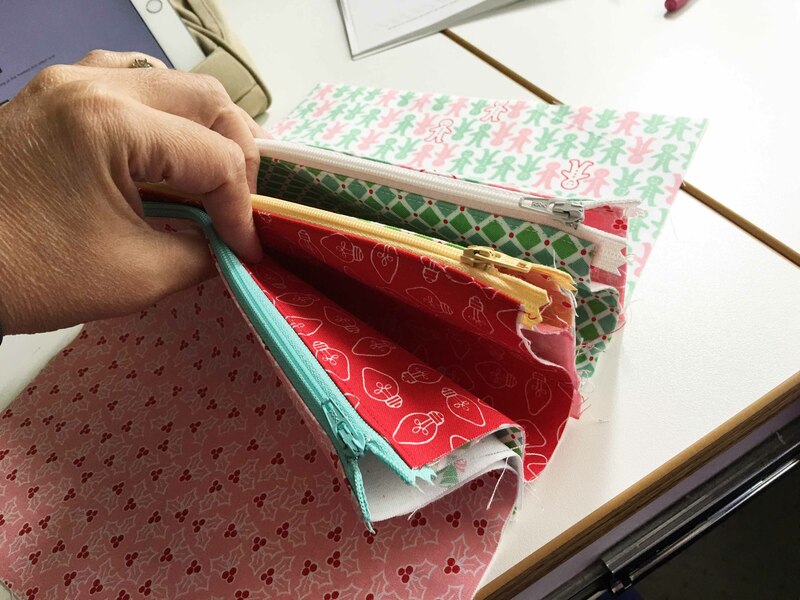 After the zippers, you attach the sides, then the exterior of the bag is attached and binding added all the way around, including the zipper which holds the bag closed. It’s pretty ingenious. Between the instructions and the tutorial, you should have no problems. I started at 9:30 in the morning, and stopped to shop, get lunch, talk to my son after school, eat dinner….and I finished by 7 pm. The next one would go even faster because I now understand the construction, and wouldn’t have to spend as much time reading. So go ahead! 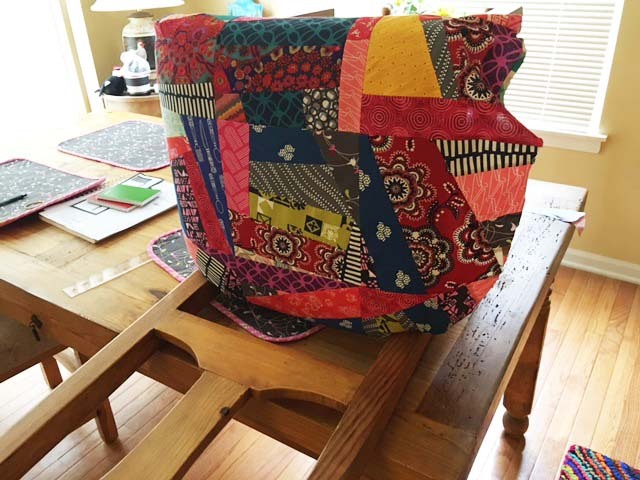 Step out of your quilting comfort zone and try one of these fun bags. Sssssshhhhhhh. Don’t tell my husband. He doesn’t read the blog, so he won’t find out what I made him for Valentine’s Day. Months ago, he casually asked me if I could make him something to sit in the treadmill tray. 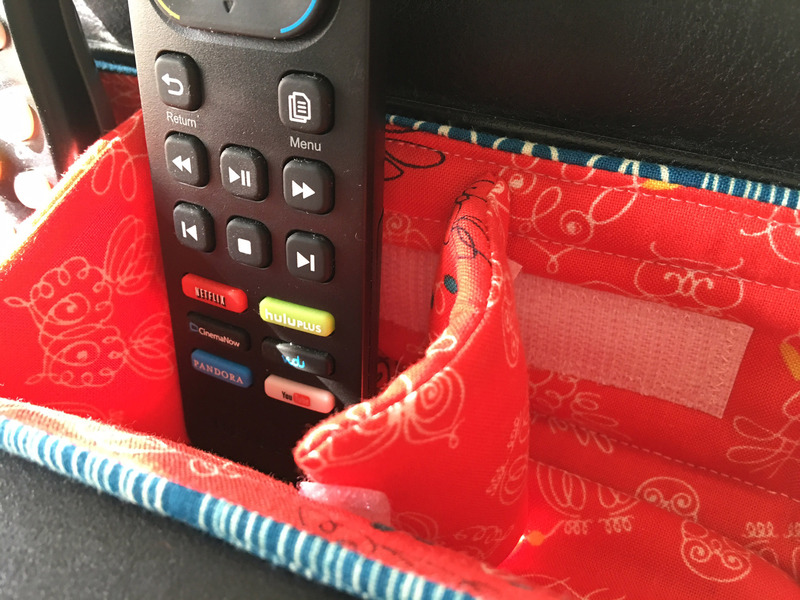 He said he didn’t like the remotes sliding around, banging against one another and getting confused between the channel remote, the DVD remote and, of course, the Netflix remote. First world problems, no kidding. I know it. Nevertheless, I said I would make something and then promptly forgot about it. So many quilts and art projects to make, so many lovely fabrics, so little time for something as unglamorous as a treadmill caddie. And it’s not like anyone has a pattern already created for our treadmill. It’s not rocket science but I did have to think it through a little. I started with a basic pattern for the bottom of the tray. From there, it was easy enough to measure the sides and the depth. Then I had to think about materials…what should I use as stabilizer? Would batting be enough? No, I decided, Soft and Stable would be ideal. If you’re not familiar with the product, it’s perfect for bags and wall hangings or anything where you want more body than batting. Ask for it at your local quilt store…most of them already carry it. After that, I had to devise a way to add compartments. I didn’t really know what size the compartments should be, if he wanted the remotes to lay down or stand upright, or just tilt out of the way. At any rate, I decide to make it flexible. The partitions can be moved around so that the caddie can hold a drink or just the remotes or different sized things. I scanned the sewing room for an idea. Velcro! That’s the ticket! 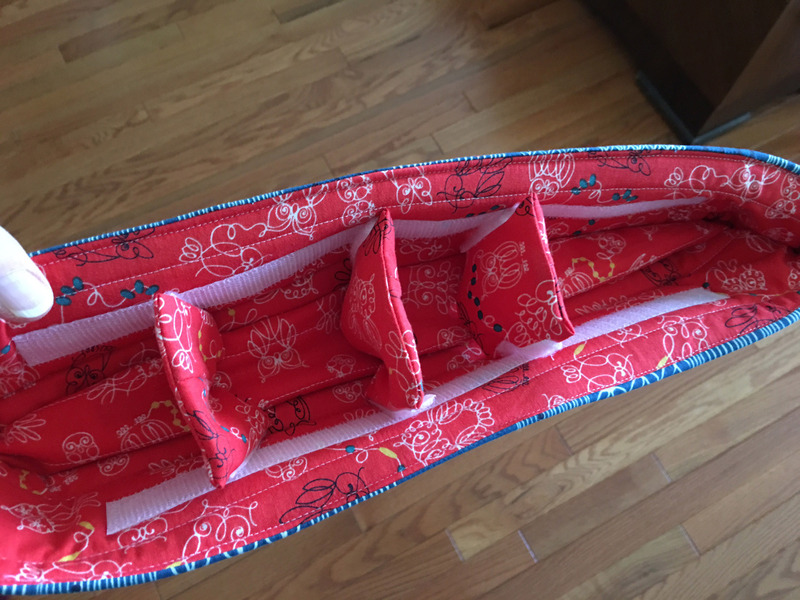 I attached one side of velcro to the lining, and the other side to the little dividers for the inside. Then I created a lining that was the same size as the outside and attached it. Strangely, free-standing it looks like a little canoe. But once inserted into the treadmill tray, it fits and makes more sense. Here, you can see a detail of how the little partitions can be moved around to support different sizes. All set and ready to go. 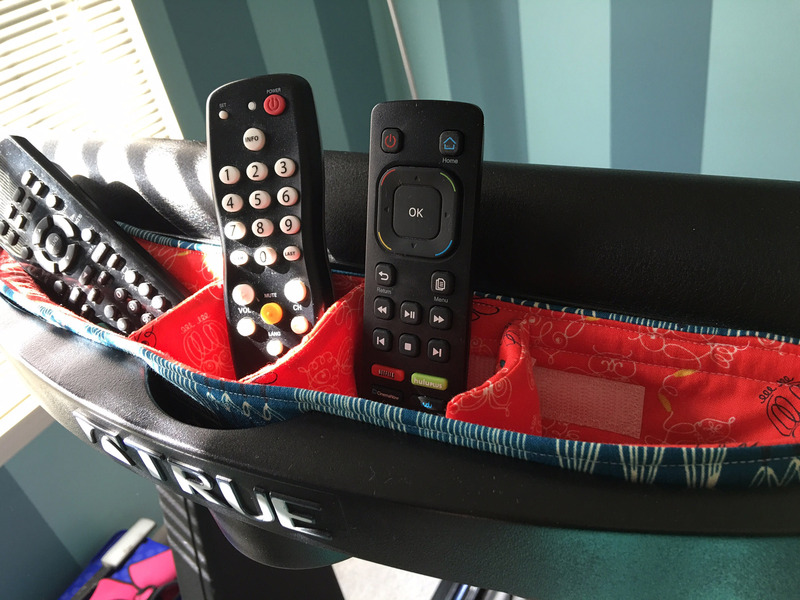 As you can see, the remotes fit quite nicely in their little compartments and are easy to grab. I can always add more partitions or move them around. What would I change? Well, I used batting on the bottom and Soft and Stable on the sides. I think I would create the whole thing using the Soft and Stable if I were ever to create another. The batting is very forgiving in terms of fitting, though. Here’s a link to a previous Valentine’s Day post. Ugly or Interesting? Read about it before you decide. I’ve been working on this quilt for my teenage son. It certainly was not my choice of fabric. The pattern however, is the disappearing hourglass that I discovered in one of the recent Block magazines from Missouri Star Quilt Co. The fabric has been the choice of my son, over the course of, oh, 13 years. If you quilt and have a child, you know what I mean. For years, basically his whole childhood, I would drag him to quilt shops. He would slouch into a chair in a corner and wait for me to finish. Usually. However, on a number of occasions, he would approach me with a bolt of fabric. Not a lovely bolt of fabric. It was usually a bolt of french fries, or pizza, or chocolate chip cookies. Was this child always hungry? And because I wanted to encourage him (and also felt a little guilty for dragging him around), I would purchase a half yard here, a half yard there. Well over the years, we had assembled quite a collection of food fabric. And this year, because he’s old enough now, not to be shuffled from quilt shop to quilt shop, I made him a quilt of all the fabric he had selected over the years. Don’t judge me. This is not what he eats every day…but apparently what he thinks about while in quilt shops. I guess what I’m enjoying about the quilt is that up close, you can see the details of the food, but you have to step back a bit to notice the quilt pattern. It was larger than I expected, hanging over the top of a full size bed, so quilting was a bit of a challenge. The border is chocolate chips. My son picked out the binding fabric which I thought was quite hideous against the chocolate chips. So I added a small flat piping to separate the two fabrics…and miraculously, it looks pretty great. I would never have selected any of these fabrics, but the random surprises of letting someone else choose turned out to be the best part. 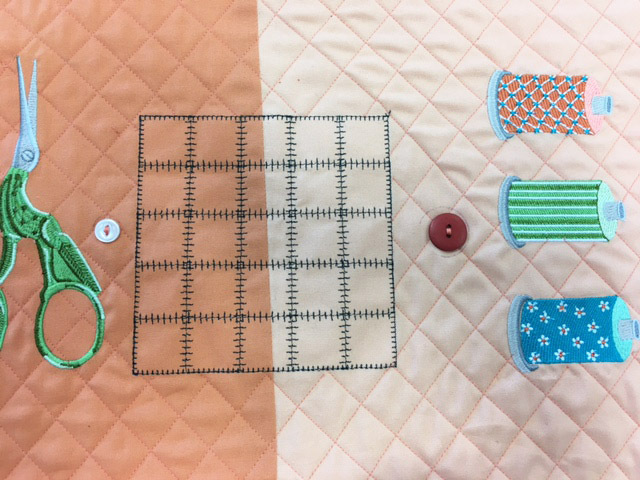 Finally, I pieced the backing from other fabrics he had selected along the way: maps, pheasants and computer gear. Want to know what floats around in your kid’s head? Bring him (or her) to quilt shops and let them wander and select a few things. You may or may not be surprised. But I guarantee it will be interesting. So, with the vest finally complete, thought I would let you see it in action. I know it’s a little creepy as everything is in shadow so the lights would show. Actually, they show pretty well in daylight too. Those little neopixels are quite bright! 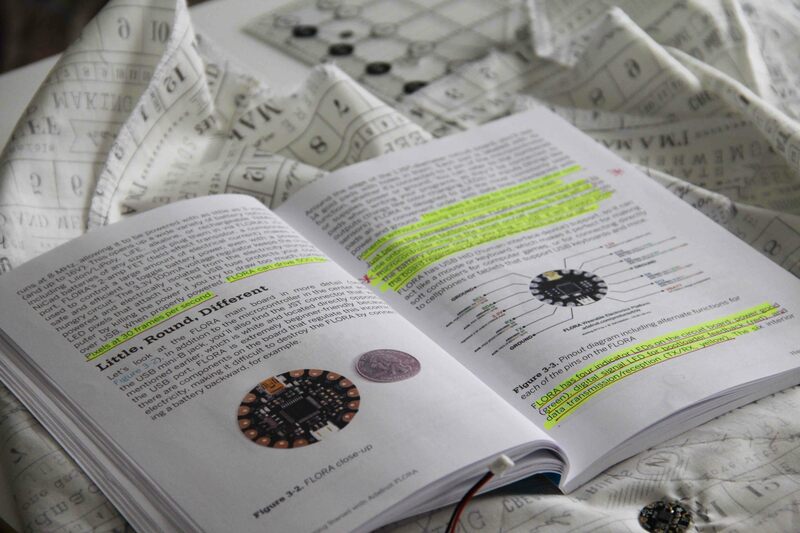 You can see that I used the Adafruit book as a reference during every step. 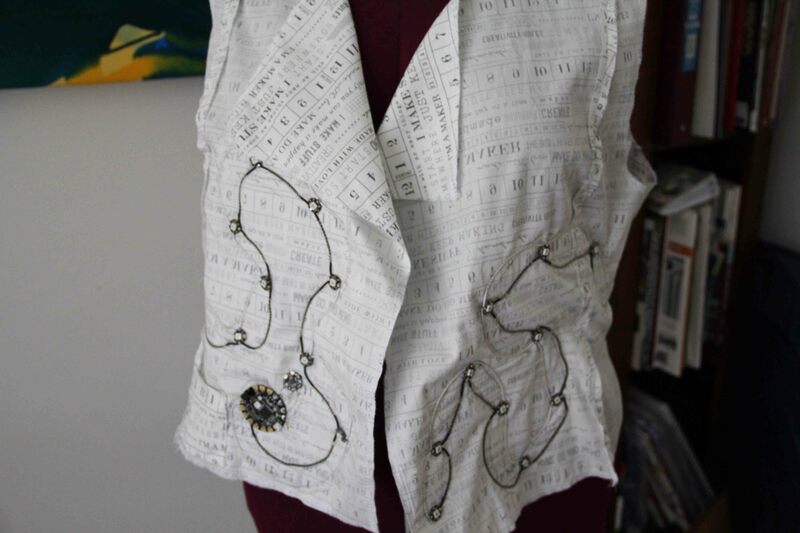 After I had the lining of the vest created, I used an erasable sewing pencil to trace out the pattern of the pixels, making sure to keep power and ground from crossing. I numbered the pixels to keep track. The next step was to handle all the wiring. The conductive thread, while it did work, would have lost a lot of power by the time it went through 19 pixels. So we switched to 22 gauge insulated wire for both power and ground. We use the thread to attach the accelerometer to the Flora and it did hold up, but did not like the silver solder at all. Working with wire and Neopixels is tiny, tiny work, much tinier than wool embroidery, or even working with embroidery thread. Be prepared with a nice set of wire strippers. Here is a pic showing power and ground and attached to each pixel with the 22 gauge wire. White was power, black was ground. Each neopixel was at least temporarily held in place. Next came the one thing I didn’t do. My husband did all the soldering. Silver solder every place the wires touched the pads on the neopixels, the flora and the accelerometer. Then I brought the whole thing to the sewing machine, and zigzagged down power and ground. I found that I needed to add a cutaway stabilizer behind all the wire and stitching to support the fabric. 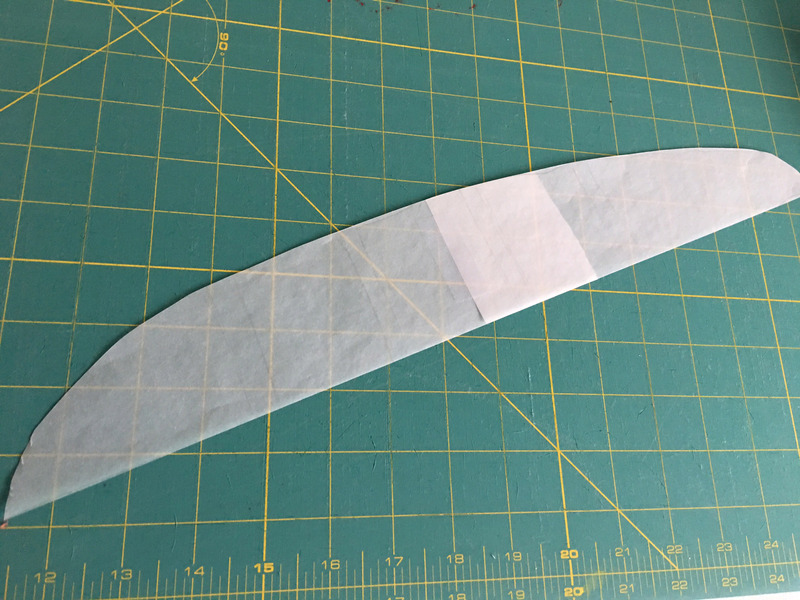 When I finished all the stitching, I went back and trimmed the stabilizer as much as possible. All of that added a lot of stiffness to the vest, but surprisingly, it still hung pretty well when I added the top layer of fabric. 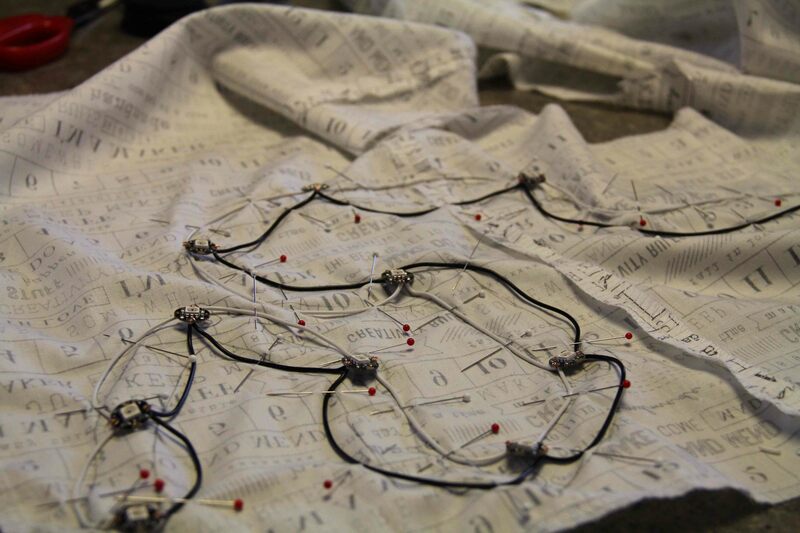 We repeated the whole process with data in and data out: wire to the neopixels, pin down, solder, stitch. Finally, I created the top layer and attached it to the lining. 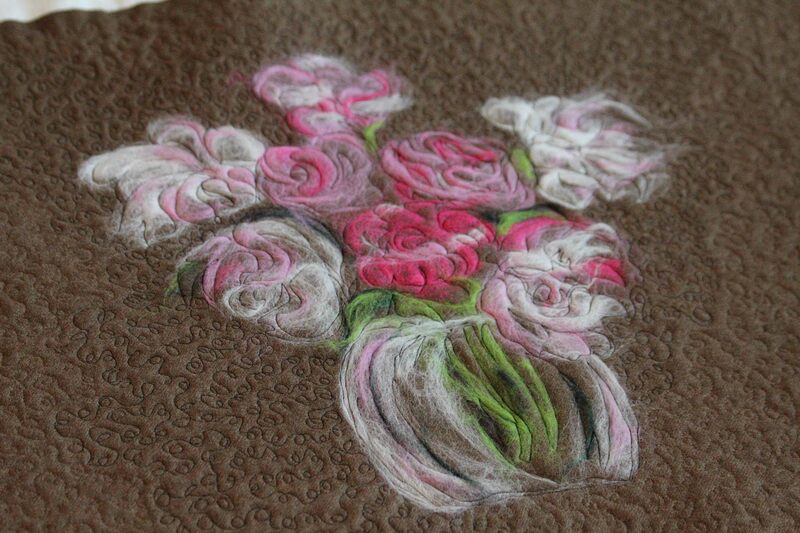 It was designed to have serged edges, one of the reasons I chose the pattern. However, I think if I were to make it again (without any wiring,) I’d do a more traditional lining and finishing technique. I’ll say this much about the project. It’s a big hit at parties. We worked together on the programming. Actually the Adafruit book is very helpful with that, as everything is done in software and transferred via USB to the Flora. My vest is programmed to do a number of sequences, based on the movement of the accelerometer. As you see in the video above, I just have to shake it, and it changes mode. Actually, I learned a great deal about simple wiring, I am proud that I could get through something like this, even with expert advice! My next LED project will likely be a bag that lights up. 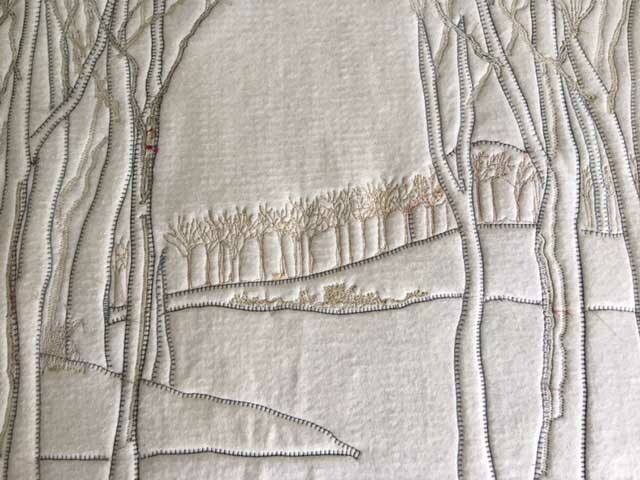 For now, I need to get back to some simple quilting. But I have lots of spare parts and I’m excited about the idea of another electronic project! LED DIY Wearables. Um, yeah. Stop the presses. Hold your horses. Shut the door. Turn out the lights. Because I’m starting a project I know so little about it’s scary. And turning out the lights might actually be a good thing. Luckily, I’m embarking on this project in partnership with a husband who happens to be an electrical engineer–a hardware guy. Someone who’s heard the term neopixel before. And I, well, I know how to sew. Together we’ve decided to create one of those DIY wearables the “kids” are building these days. Go ahead. 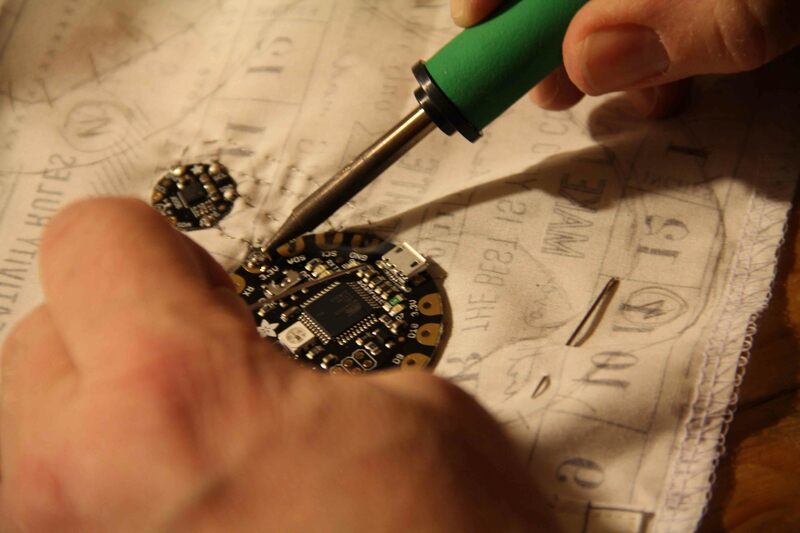 Google DIY Wearables with LED. It looks like fun, right? I’m not starting totally clueless. 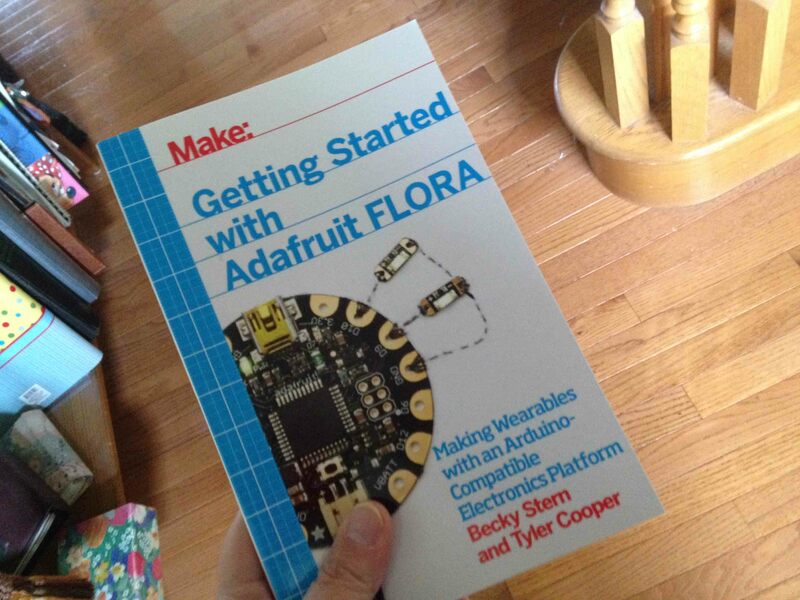 I purchased this book (Getting Started with Adafruit Flora by Becky Stern and Tyler Cooper) which, frankly, I only understand half the words on the cover. However, diving into it is much easier with a handbook, and I do have someone to consult when I’m completely baffled. The first decision we had to make (as a couple) was what project to work on, and then how it would be lit. After doing the research, I settled on a simple serged vest, to which I will add a lining. 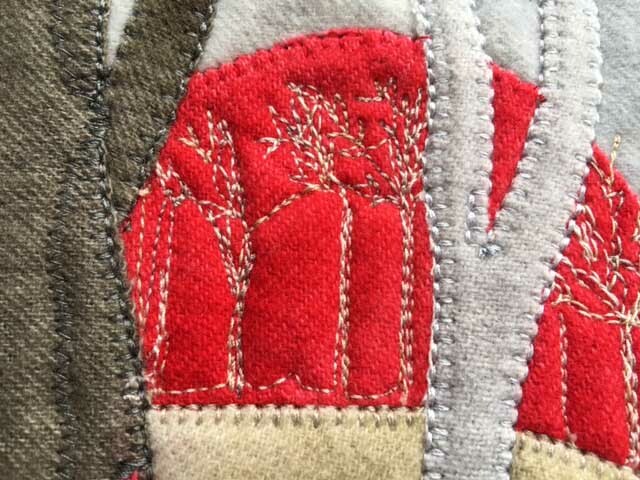 The lighting would be sewn to the lining, and the lights will shine through the top layer. That’s the plan. For now. 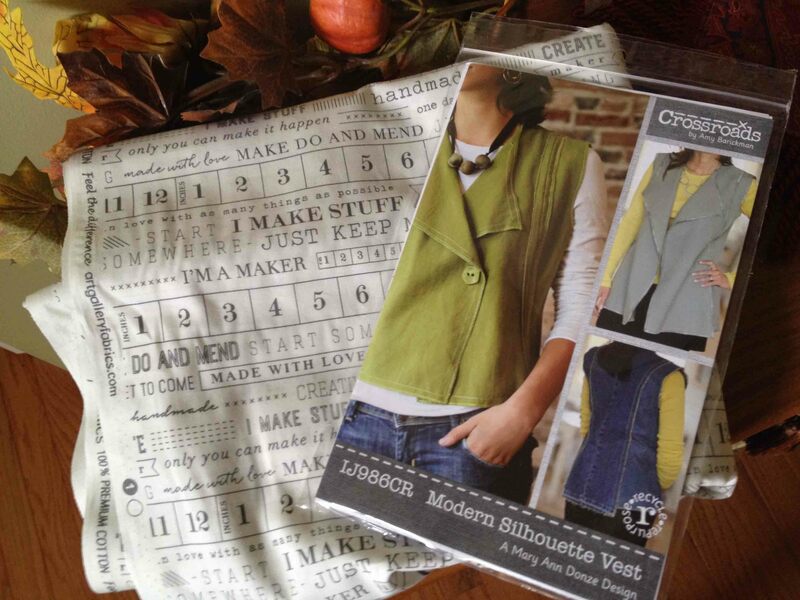 The pattern I’ve chosen is Modern Silhouette Vest from Amy Barickman. 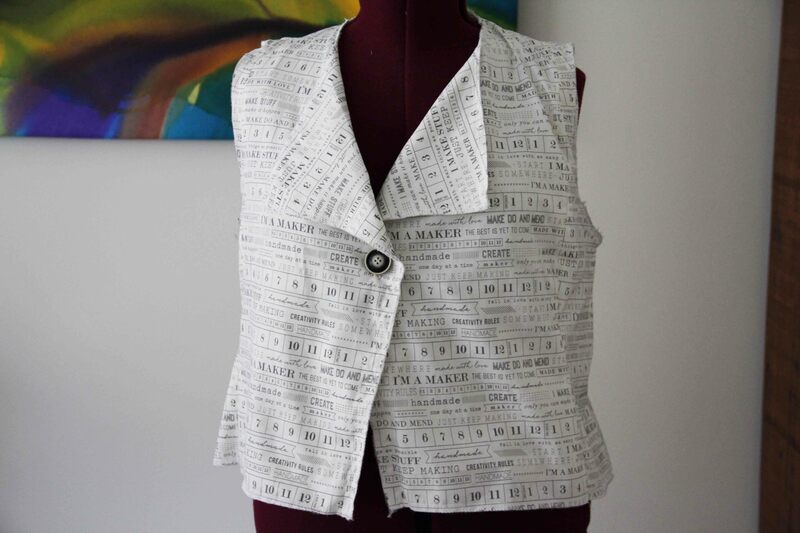 The fabric is called Maker, from Art Gallery Fabrics. Seemed appropriate. –I wanted to run a string of lights from front to back on the vest in two places…not cheap to purchase those light strips by the way. They come in meter long sizes. However, the strips are encased in hard plastic which is just not going to lend itself to the shape of a vest. Or a human being, for that matter. –So I modified the design to have an all-over sprinkling of lights which I can program to patterns and colors. –The battery is rather heavy for what I’m looking to do, so I might have to design a pocket in the lining to hold the battery, or we may actually need two batteries. This is something I’ll have to modify along the way. –How to attach all those lights. 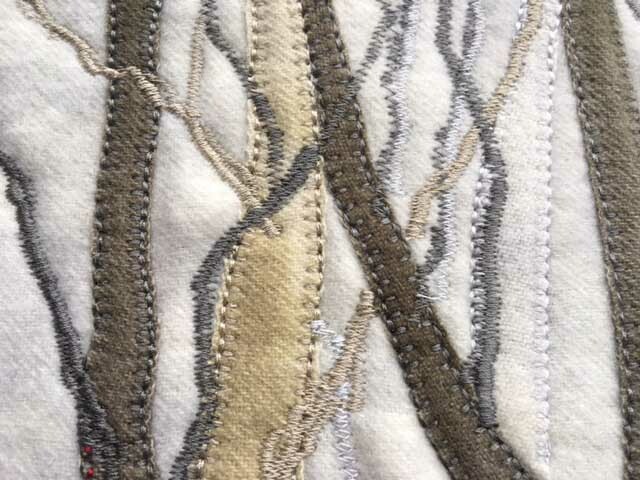 I think they must be hand sewn with conductive thread, and all connected to one another. This is where my partner comes in. He’s here to make sure I don’t electrocute myself or start the dang vest on fire. –How to program and what sort of controller to use. I have to get into a few more chapters in the book for that.